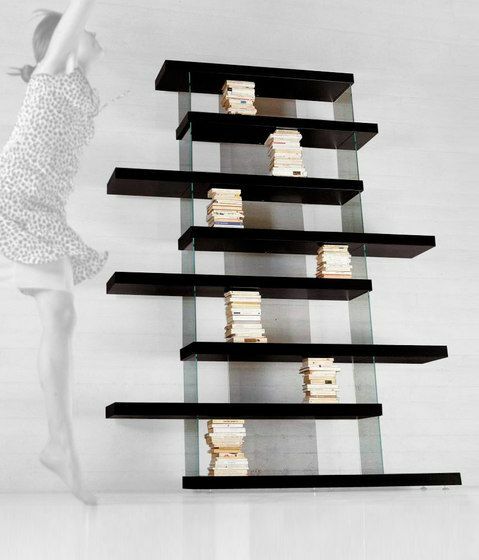 Air is a system of tops and shelves that create floating bookshelves. The substantial thickness of the shelves contrasts with the buoyancy of the Starphire® glass interlocking supporting structure, giving each composition a floating appearance. The bookcase has glass uprights that support the wooden shelves. The reversibility of the central shelves together with the easy assembly, also allows transforming the product making it more or less dynamic depending on the individual taste. Air is always double faced and therefore can easily be positioned in the centre of the room.